Our Day at Hands On! The kids had a fantastic time! A great time for the Backyard Explorers for sure. 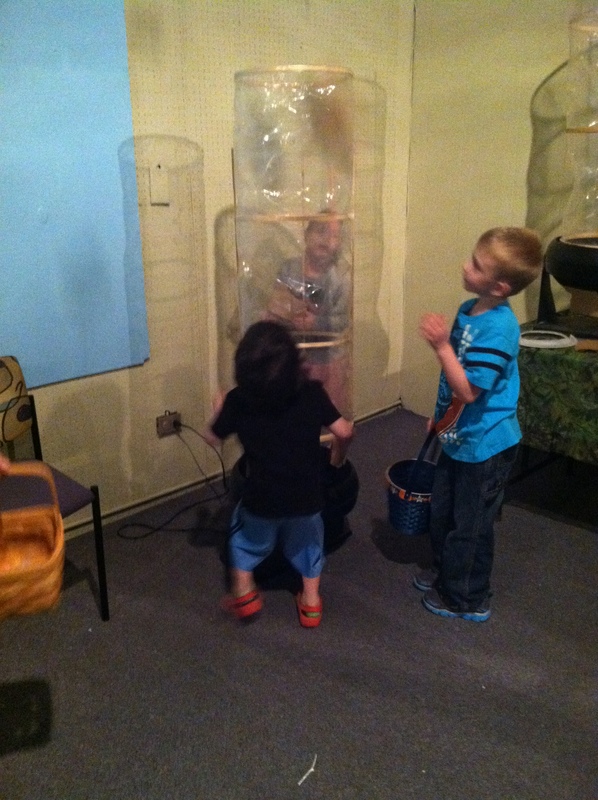 We started out in the exhibition hall for the egg hunt. They had a dozen or so dinosaur themed stations. 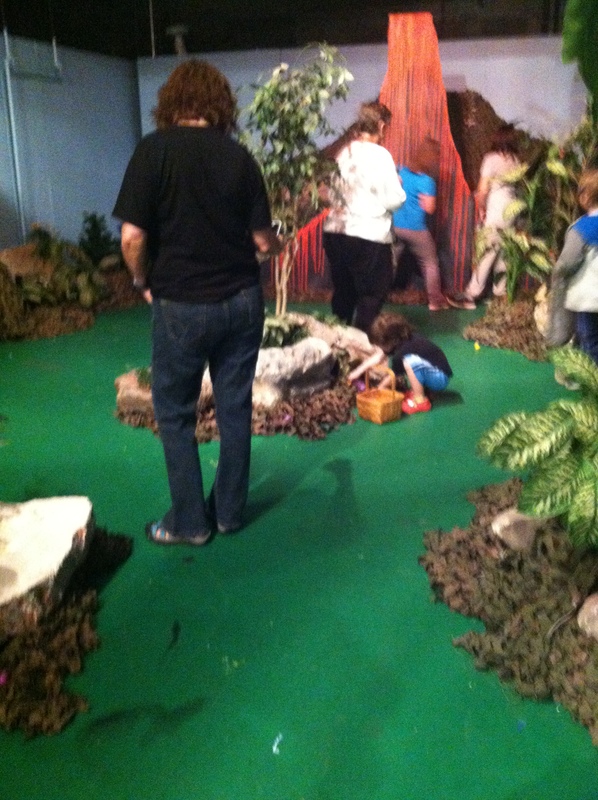 Both kiddos made a beeline for the dino egg dig pits. 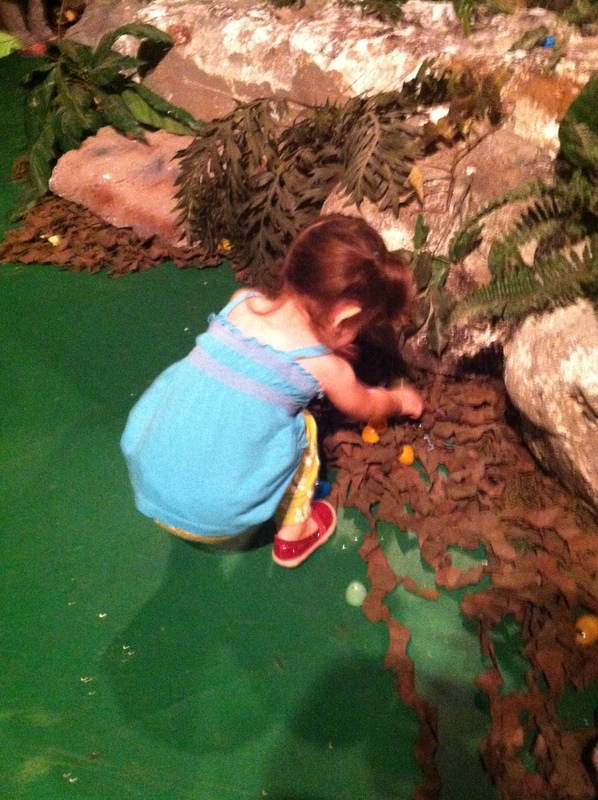 Each egg had a small dinosaur/dinosaur era creature. The kiddos weren’t thrilled that they only got one egg to keep. 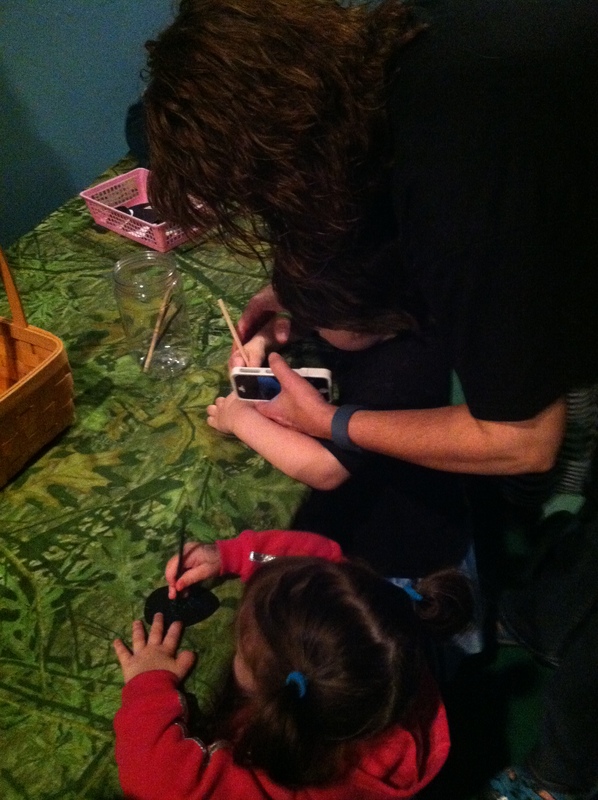 It took a few explanations that they could only get one so all the kids had a chance to have an egg. Punk grudgingly accepted the news. Bug is still a bit young to understand it. After they dug up their eggs, they dashed over to the glacier gack station. Both of them had a blast with that! 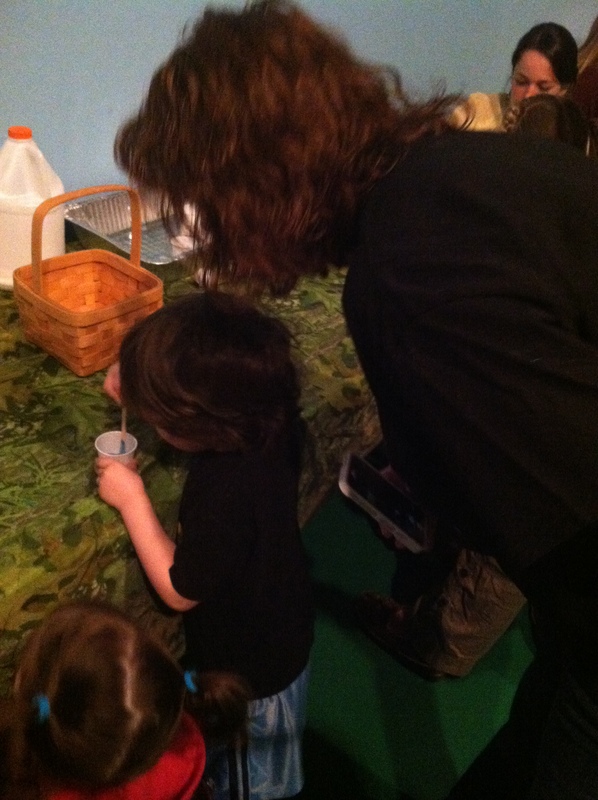 Punk proudly mixed his glue and food colouring mixture while Bug debated on giving it a try. 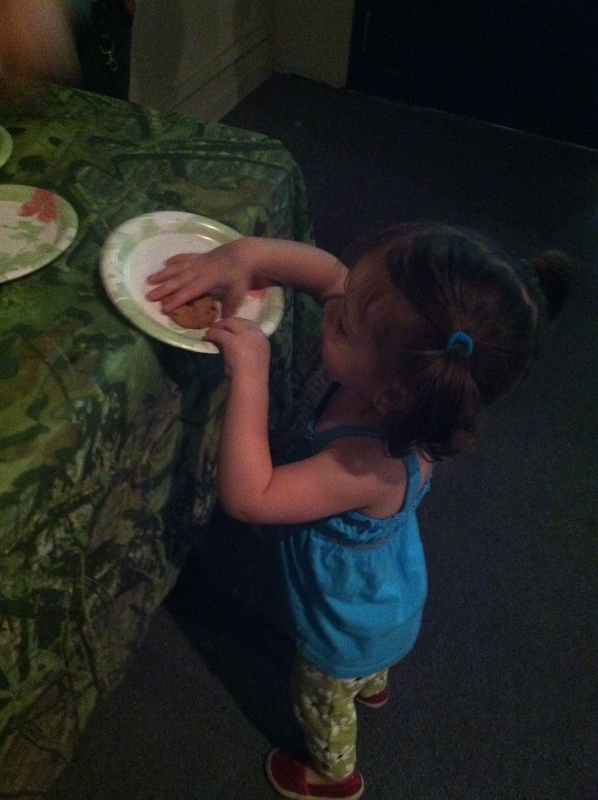 Seeing how much fun Bubby was having, she finally begged to do it too. She needed a bit of help with her mixing, but was a champ about it. Sometimes getting help is a big thing for her. She’s fiercely independent and does not like needing help. 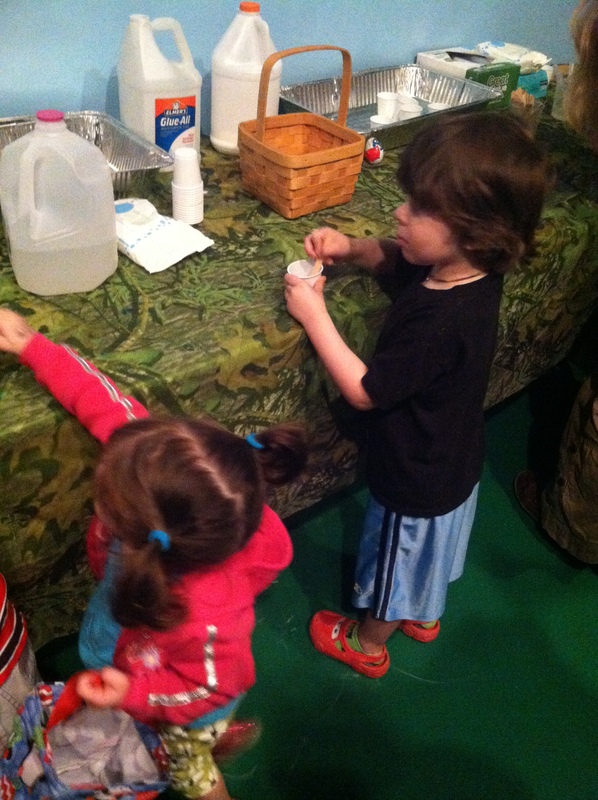 The girl added the borax mixture to the glue and the kids were delighted to see the change happening in their cups. They were so excited that they got to bring their gack home with them. After they finished their gack, we moved on to the next station: egg scratch drawings. Again, another hit! They both got a black egg and a scratch tool to make their designs. Punk was disappointed that his egg didn’t easily scratch well, but was placated when Grammy told him this was a project that could be done at home. Mommy just has to get the right paint! We can also do it when we do our Australia goodies from our Little Passports World Edition. They just don’t know that yet! After the egg scratching, we got in line for the egg hunt. 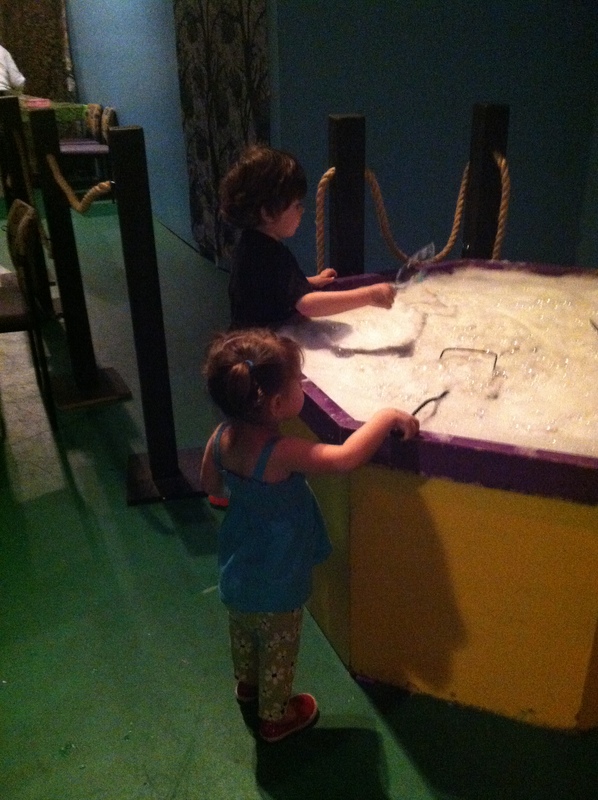 There was a bubble table to play in as we waited. Of course, we had to wait for that as kids in front of us had a turn. Lots of impatient begging happened! Punk and Bug LOVE bubbles. Seriously. If you need a spring/summer goody for them, bubbles will get you FAR. When it was our turn to go through the egg hunt, it turned into every sibling for his/herself. Punk dashed off with Grammy and Bug led me around, cramming as many eggs as possible in her penguin bag. Once their baskets were full, we went into the treat tent. Bug eagerly forked over her egg booty for candy. Punk needed some persuasion. He didn’t want to accept that the eggs weren’t for keeps. He reluctantly surrendered the eggs and grudgingly accepted the candy. A promise of Mommy hiding eggs cheered him up and he asked for a sucker from his bag. We made another stop at the bubble table before heading to another station. 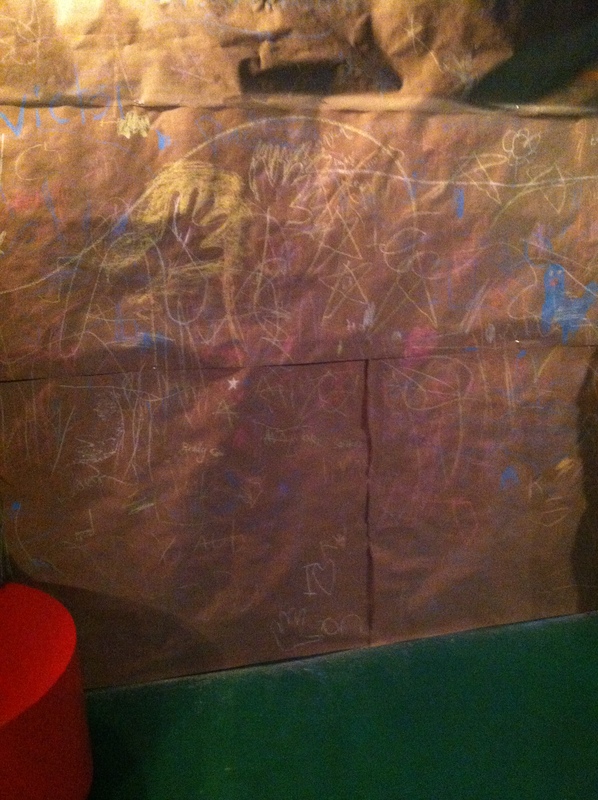 We passed a “cave drawing” station. There wasn’t room to add to it within their reaches, so we didn’t stop. Punk spotted the dino putting area and darted for it. Let’s just say the PGA or WPGA is not in their future! They enjoyed it though and that’s what matters. Bug went back to the dig pits, but was disappointed that there were no eggs left. She enjoyed excavating the mulch anyway. Don’t be fooled by the almost constant need to wear skirts or dresses. She will get down and dirty and play hard! Punk spotted a parachute station and dragged Grammy to it. I think he would’ve stayed there all day! He loved launching his dinosaur paratrooper in the wind tunnel. 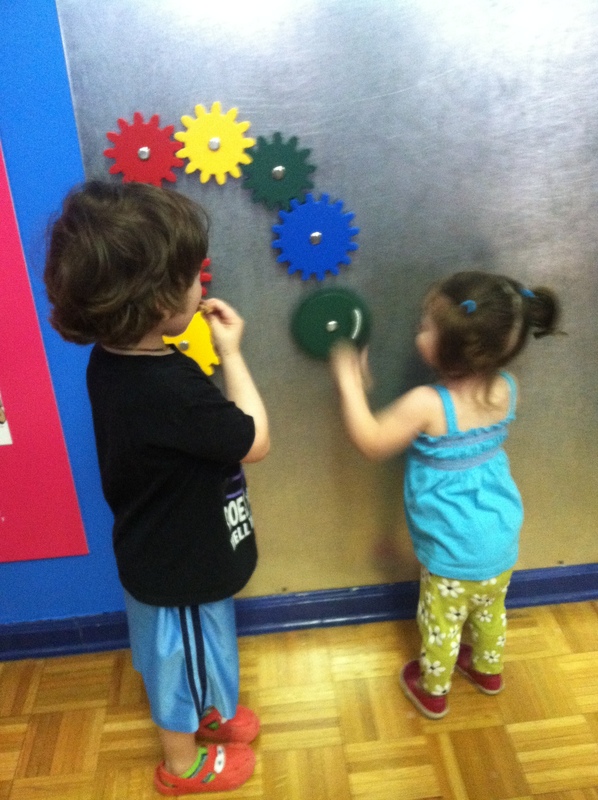 Only a promise of Grammy & David constructing one this summer and cookies from another station lured him away. Bug noticed the egg decorating station, and we managed to scrounge up two eggs for them. Since we were going to check out the rest of the museum, we were going to let them stay in the event area as long as we were allowed. Bug decorated her egg with flowers and Punk made an Iron Egg with Iron Man stickers. We weren’t the last to leave, but it was close! They spotted the gear board in the entrance and played around with it. Only the promise of more goodies got them to leave it. 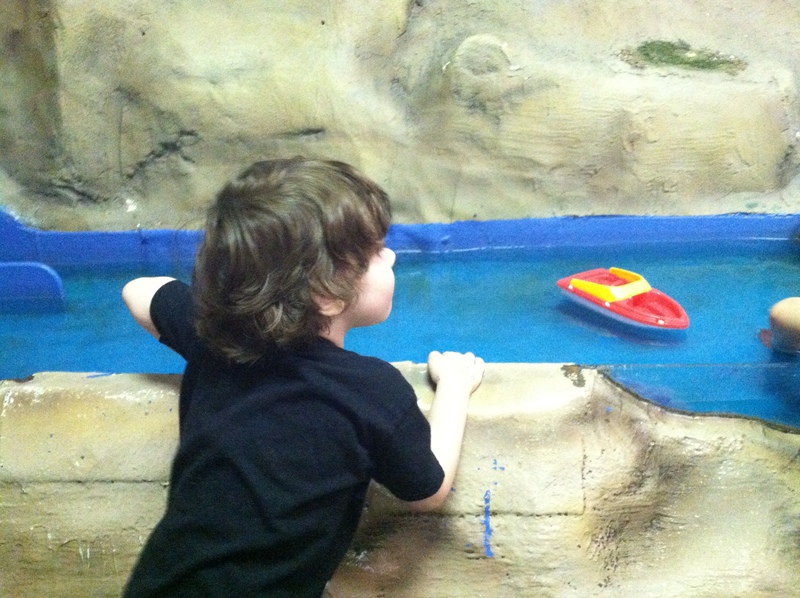 Of course, they zeroed in on the messiest and wettest part of the museum: the boat canal. Pretty sure we spent a good 20 minutes there and there was much gnashing of teeth and bodily removal from the area. Mama also regretted not grabbing a change of clothes for both of them! Punk was a little wet and Bug managed to drench her shirt. They had fun exploring a dissected Saturn car before running to the jungle gym area. Punk found a train table and Bug went for the slide. Proof of them having similar interests, but different priorities! (: Grammy stood guard, keeping an eye on both of them while Mama ducked into a human body room. 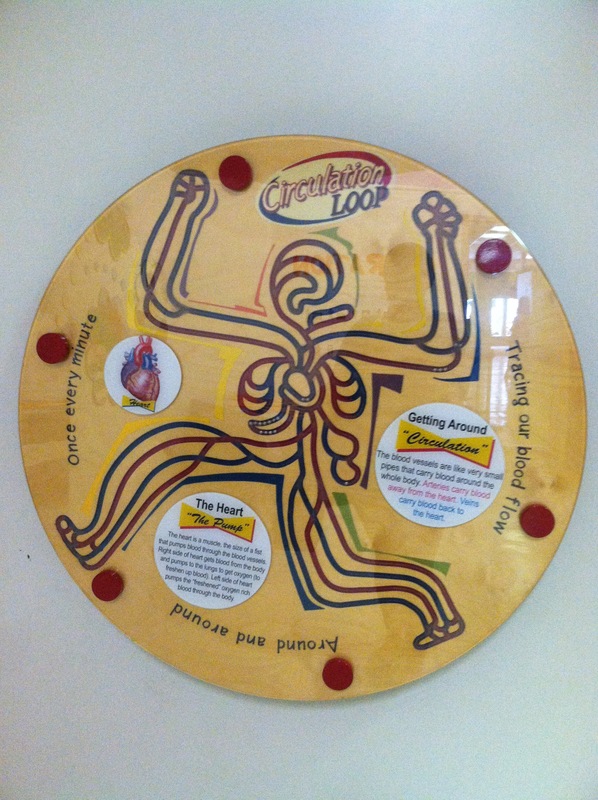 Giant size operation and a circulatory system maze! I loved it, Punk never peeked in, Bug gave it a passing glance. 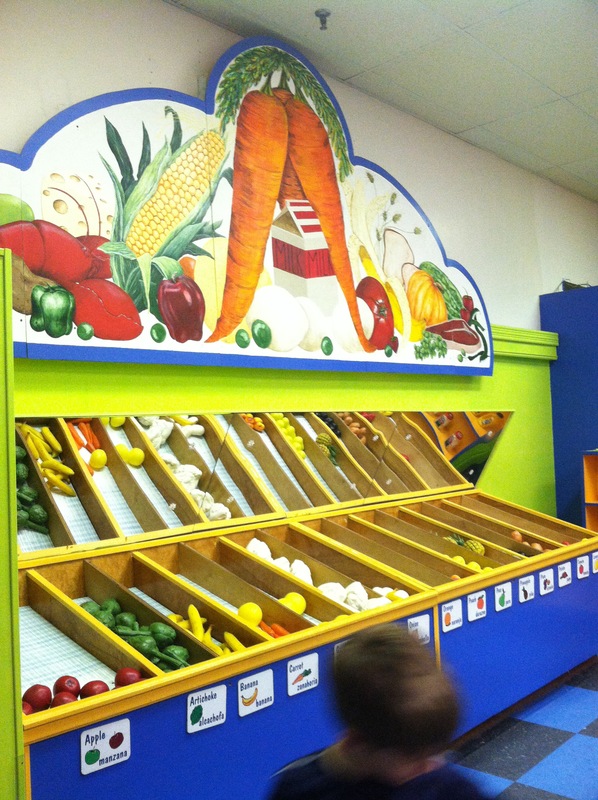 The mini grocery store finally caught Bug’s attention and we spent a good bit of time in there. 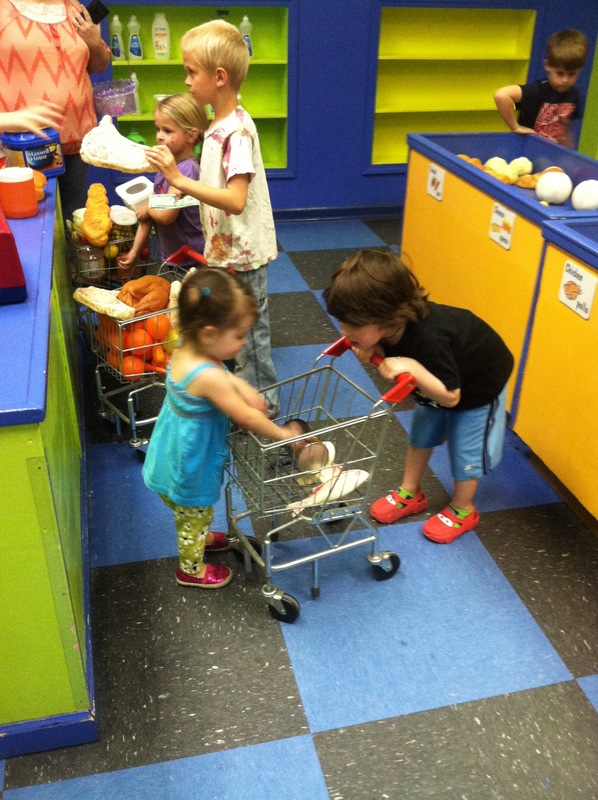 They love going to the real grocery store because I include them in selecting items. They generally get free reign in the produce section, so getting to “shop” by themselves was fully enjoyed. Grammy and I finally managed to get them downstairs to explore there too. I wasn’t surprised at all to see Punk go straight for the aeroplane. He’s obsessed with planes. Planes and Planes Fire and Rescue are frequent requests. Especially Planes Fire and Rescue . Planes AND fire fighting? Pure heaven for Punk. Bug decided to investigate the tractor before exploring the plane. They would’ve stayed in it til we made them leave if it hadn’t been for other kids coming to see the plane. 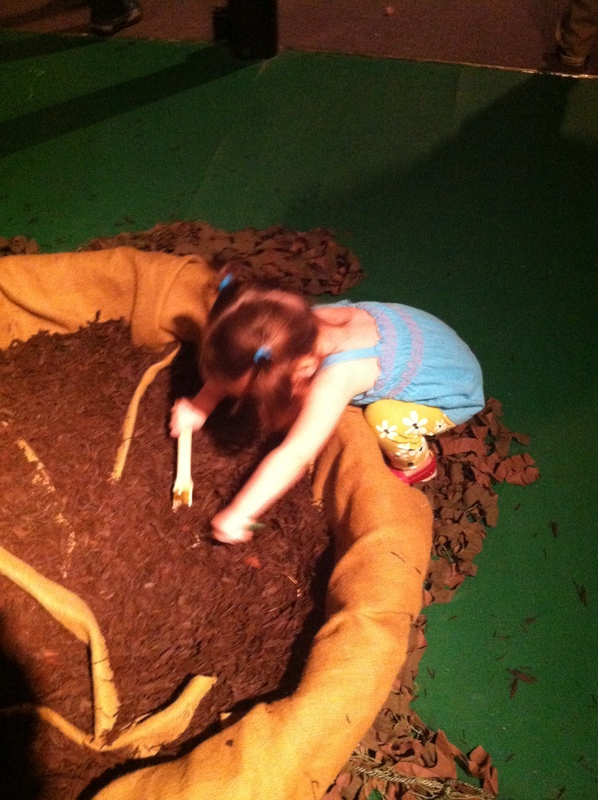 We checked out the fossil pit, but it had been pretty picked over by naughty kids thieving. 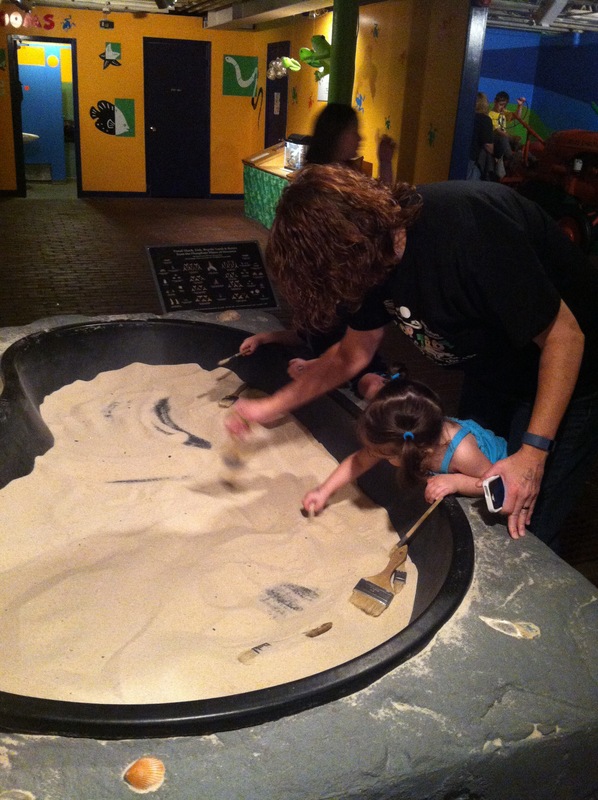 We did manage to find a few teeth, so it wasn’t just scooting sand around. 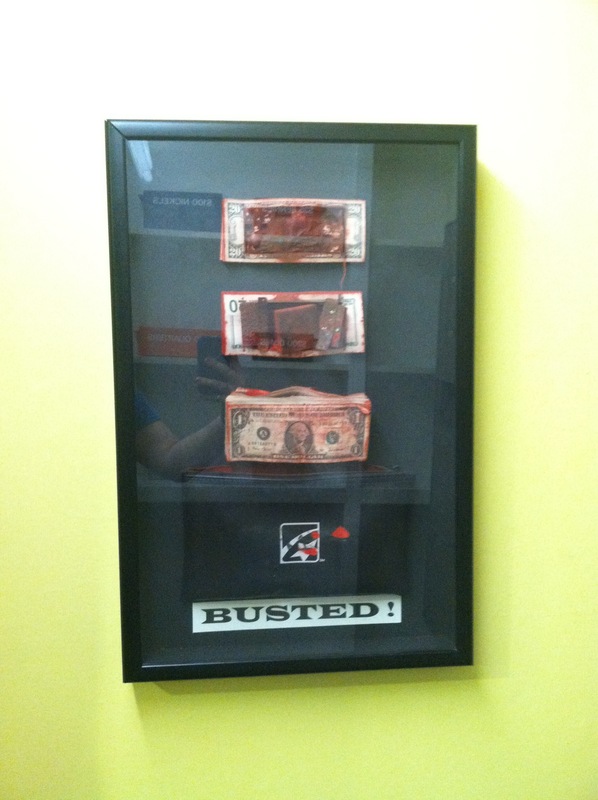 They noticed the bank and that’s all she wrote. They’re both very interested in money right now. Especially Punk since he’s earning money and tokens for his Lego table. Bug prefers coins cause they’re shiny and make noise! 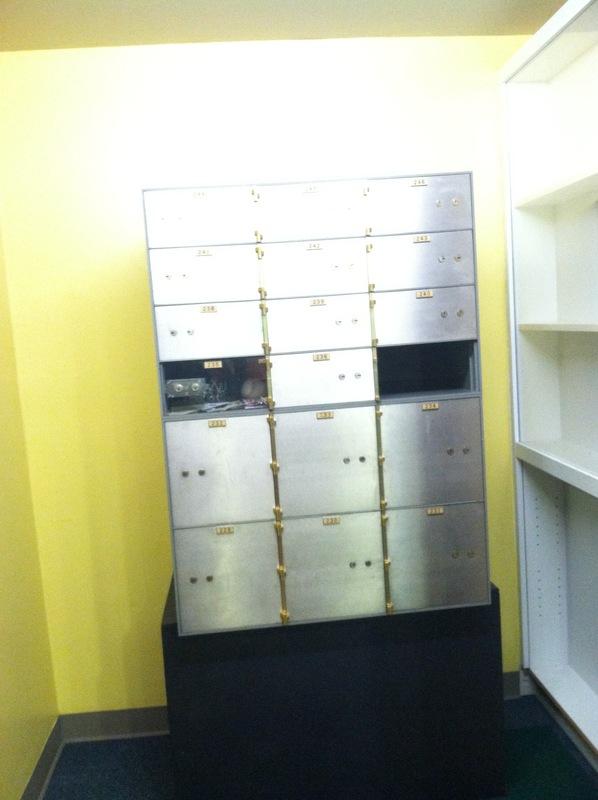 Punk operated as a teller at the computer and answered the phone, played at the ATM, was the window teller, and explored the fake vault. He spent the rest of our time there. 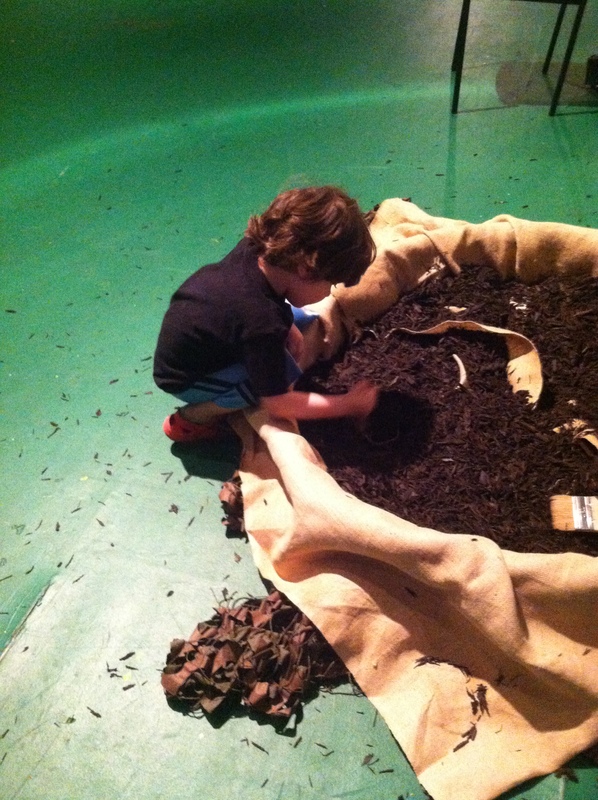 Bug and I took a trip into the stop motion room. She thought it was neat to see our position frozen on the glow wall. 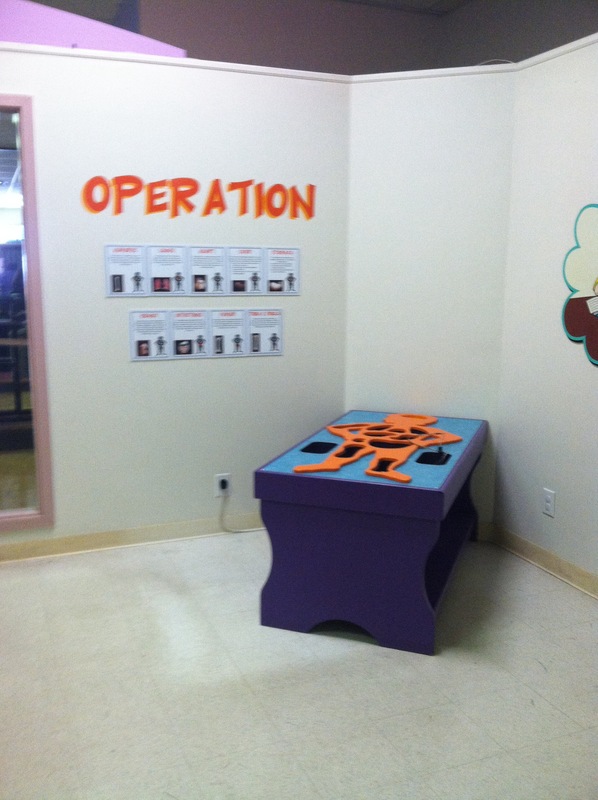 I remember we had a blast in there when my Girl Scout troop stayed! On the way back upstairs, Punk showed off his strength at the pulley station, investigated the tractor, took another flight in the plane, and checked out the fossil put one last time. 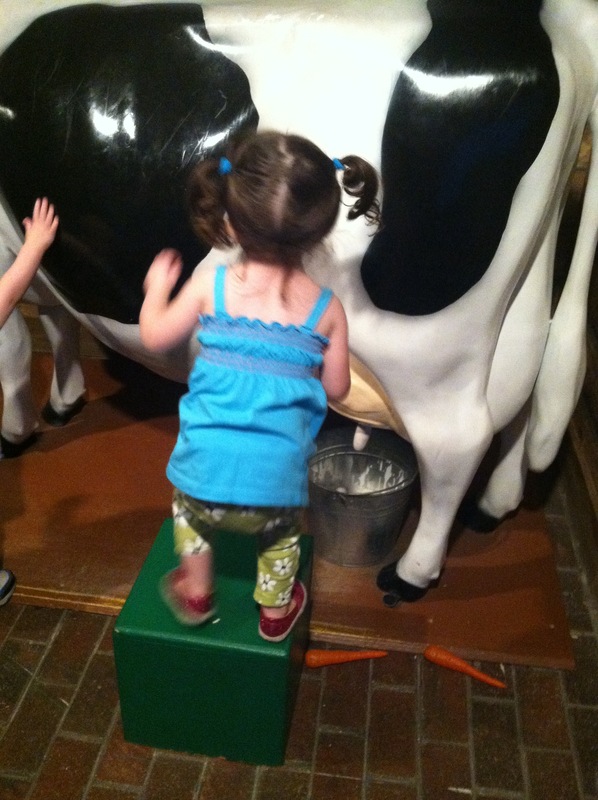 Bug also “milked” a cow! We promised to stop at the boats on the way out and Punk held us to it. There were many exhausted tears shed as they were carried away from the boats. Tears slowed with the promise of returning soon. Be warned anyone who comes to visit us, you will probably be dragged to Hands On! We had a blast and it was worth the money to see them have so much fun! (It also wasn’t as much as I was figuring it would be for admission. PLUS they have a military discount which goes far with this Army wife!) 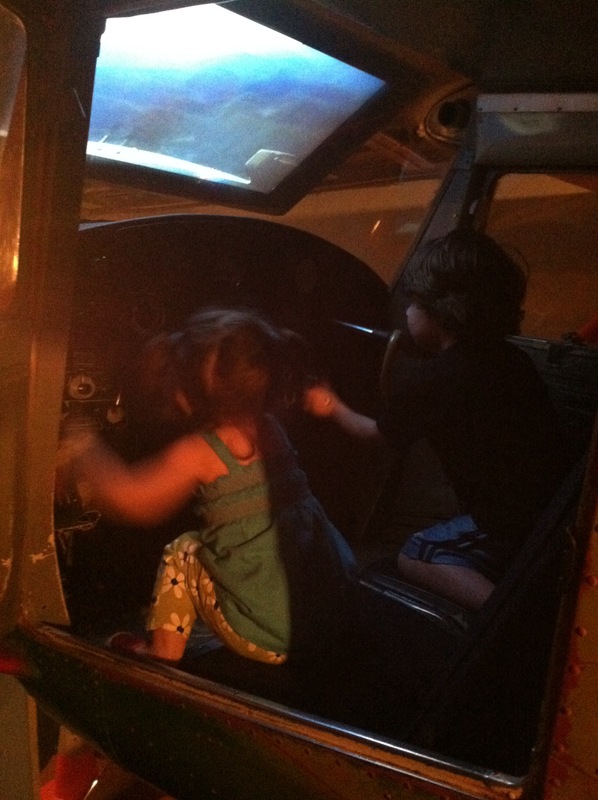 It was cheaper than taking them to the movies and way more educational. Maybe even more fun! The Backyard Explorers will voyage back soon!